Hyundai Motor India Limited (HMIL) is an Indian subsidiary of Hyundai Motor Company. HMIL commenced its operations in India in May 1996. At present HMIL has more than 400 automobile dealers and above 1,200 service outlets across India. Why is it Important to Insure Your Hyundai Xcent? As per the Motor Vehicles Act, the Indian government has made it mandatory for every car owner in India to insure his or her car. Another reason to insure your vehicle is that car insurance financially protects you from unforeseen liabilities that you may incur due to a mishap. This car insurance policy offers extensive coverage by covering both own damage as well as third-party liabilities. This car insurance policy provides limited coverage by covering third-party liabilities alone. You can visit third-party insurance websites or insurer’s official website to purchase/renew the car insurance of your choice. Most of the insurance websites have premium calculators that give you quote on the estimate of your car insurance premium. You can also visit the nearest office of the insurer or meet with an insurance agent to purchase or renew the car insurance of your choice. Inform the insurer as soon as the mishap happens and raise a claim request. File an FIR at the nearest police station in case of theft or accident. After your claim has been registered, the insurer will send an authorised surveyor to assess the total loss/damage incurred due to the mishap. You will have to submit originals and copies of the requested documents to the surveyor or the insurer for verification. Post verification of the documents you can take your vehicle to the nearest garage depending on the kind of claim you have raised. In case of a cashless claim, take your car to the nearest insurer authorised garage and get it repaired. Post repairs, the insurer will pay for the complete repairs directly to the garage. In case of reimbursement claim, take your car to the nearest garage and get it repaired. Post repairs, you will have to settle the bills directly to the garage. Submit the repairs invoice and payment receipt to the insurer and get the amount you spent on repairs reimbursed. 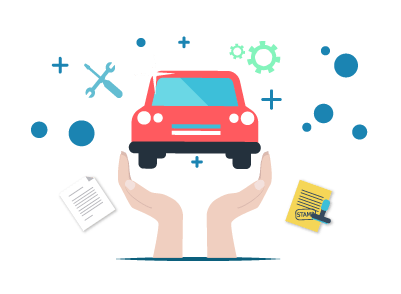 What is a voluntary deductible in car insurance? A part of the insured amount that you opt to pay at the time of claim settlement is called voluntary deductible. Yes, your geographical location has an impact on the car insurance premium you pay. Yes, You can cancel your car insurance policy anytime, provided you don't have a standing claim 30 days prior to the policy cancellation and you have availed another car insurance for which you can submit relevant proof. What does depreciation in car insurance mean? Depreciation in car insurance is the loss in the market value of your car due to the regular wear and tear of the car as a result of aging. A cover note is a temporary document that is provided by the insurer to the insured until the original insurance policy document can be issued. The cover note will have all the relevant policy details and is valid for 60 days.